I'm completely hooked on crochet! 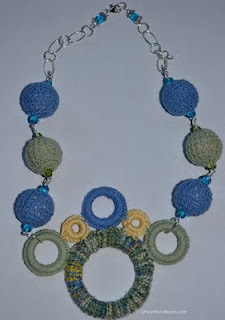 Okay that is not all that I am crazy about, I love to bead as well. Yes I love to sew and do paper crafts and try new things. Recently I received my copy of Crochet Today magazine. There was a pattern in there for Modern Ring Necklace. I liked it a lot and was completely inthralled with it. I had to make it but wanted crocheted beads as well, so I made my own version of it. It's a bit funky and a bit bigger then I would have liked but I will make changes to it later if I don't like wearing it. But for now this is what it looks like. There version of the necklace was featured in the May/June issue. It did not include the crochet beaded balls. 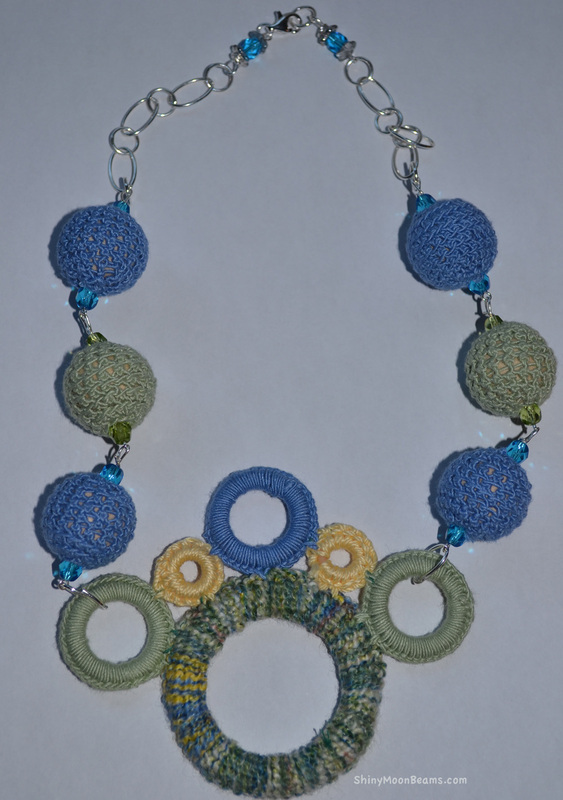 I like this one better, forgot that I had these porcelain rectangles, the other necklace with the crocheted front is out of place and to big. I have more rings! can make a few more in different colors, perhaps to sell on my Etsy Shop Shiny Moon Beans, keep your eyes peeled. I had put cat's eye beads around them thinking I would attach them to each ring that way, but didn't like the looks of those beads, perhaps some seed beads in matching colors would be pretty next time for more security then the silver links. Here is a pattern to follow to make the wood bead covers using crochet. 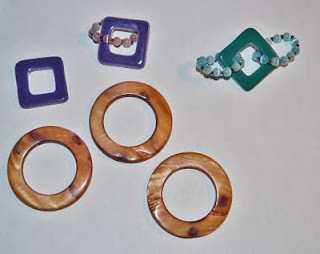 Round Wooden Beads 20mm or size you desire (Directions Given are for 20mm Wooden Beads). Guage 16 sc = 1"
16 sc rows = 1"
Draw up a loop in each of next t sts, YO and draw through all 3 lps on hook, decrease made. Rnd 1: work 7 sc in 2nd ch from hook; do not join, mark beg of rnds. Rnd 2: Work 2 sc in each sc: 14 sc. Rnd 3: (Sc in next 3 sc, 2 sc in next sc) 3 times, sc in last 2 sc: 17 sc. Rnd 4: through 9: Sc in each sc. Rnd 10: (Sc in next 3 sc, sc 2 tog) 3 times, sc in last 2 sc: 14 sc. Place bead in crocheted cup, making sure bead hole is placed vertically in the center of the cup. Rnd 11: (Sc 2 tog) 7 times: 7 sc. Finish off, leaving a long end. Thread end of tapestry needle and weave through rem 7 sc; draw up a tightly to close, and secure. Weave in ends. 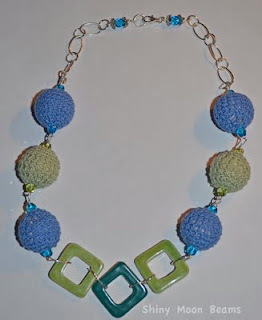 Here is another really cute necklace on the Crochet Today Website by Crafter Org and Jewelry Challenger Winner a Cherry Blossom Necklace by Sandy Meeks it's just gorgeous, I must try this one next. This Bridal Necklace is really gorgeous also and used Aunt Lydia's yarn also. I love this Bevy of Bankles bracelets show on the Crochet Today website, I think I will be making those for my girls for Christmas they look quick and easy. I love all the jewelry projects, but I also love the other patterns in the magazine as well. 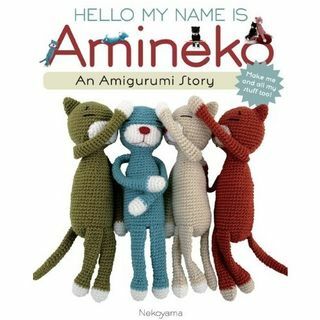 There was a little add on page 31 in the Crochet Today about a sweet little cat crochet pattern Hello My Name is Amineko, I just got done stitching this adorable kitty and need to stuff it and sew it together. I made mine with Caron Yarn using the Ocean Blue color. You can find the pattern for the kitty here. It took me a bit over 2 days to finish the cat, but I only worked on it in the evenings. I can't wait to get it all stitched up though! I am now starting a green cat, cousin to to the blue one I just made. (will show it off in next post). The book with directions for several sizes and outfits is available at Amazon, but I seen the book at Michael's as well. Amazon sells the book cheaper even with shipping cost of $3.99. Though if you purchase over $30.00 of product from Amazon your shipping is free.